Keuka Village Red (2011) and truffles make nice. Photo from Ravines Wines. EARLY spring is such a tease. Winter’s gray skies burn off into gorgeous incandescent blues. Warm breezes park themselves above us, foretelling hot days ahead. But ever the faithless flirt, spring flits the scene, leaving us once again with a windchill, the threat of flurries at night, and the baffling sensation of having been stood up. 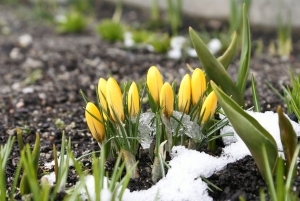 Nevertheless, if spring ever wanted to come around again, there we would be, following without question. Saucy, fun, playful and light, who wouldn’t want to bask in spring’s glory? Now there’s a wine that’s perfect for these fun, fickle but promising times. Typically, rosés have been the fashionable choice for the past three years, but let me introduce you to a novel alternative: a curious wine from the Finger Lakes region. Narrator: Finger Lakes. Are you a Riesling? Narrator: Wait – you’re not French? CW: Non, non, non! Moi, je suis Americain. New York. Narrator: OK. Whatever. Finger Lakes, NY, and not a Riesling. Are you a Lemberger? CW: Good guess, but not quite (batting eyelashes). CW: Do you give up? CW: Well, alright. 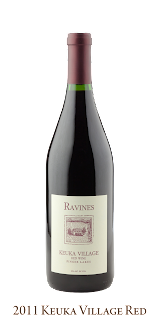 Ravines Wine Cellars' Keuka Village Red 2011. I’m just a basic red. Yeah, and you fell for that. Like I said, this wine is saucy. The label reads wine, but understand that the first impression – the aroma from the bottle (nose) – is redolent of grapefruit. Ripe, juicy, luscious grapefruit. 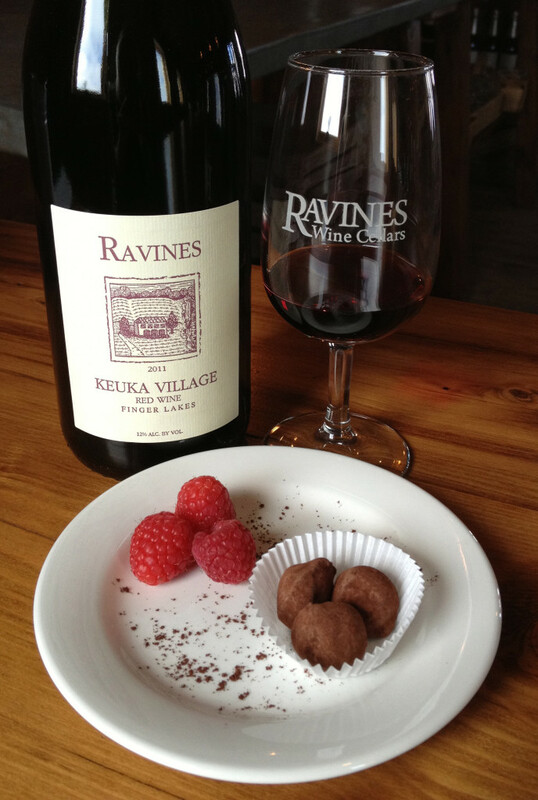 Like spring flowers, the Keuka Village Red suggests something wonderful. Photo courtesy of Swirus71. Thankfully, the hands know the difference between a wine bottle and a juice jug because by now the brain is fully scrambled. Which one to trust? The nose or the fingers? Can they possibly go together? I mean, really now: grapefruit? In a wine? Seriously? Is Ravines Wine Cellars putting one over on us? The grapefruit nose continues to tumble out of the bottle, as if a freshly peeled skin lay nearby. Red wine, but of a curiously light shade, tumbles into the glass, more reminiscent of red currant juice than the rich deep tones of a Petit Syrah. Intriguing, but then again, it’s time for a reality check. We’ve all had our wine hopes dashed before. Keuka Village Red (2011) puts step into spring. Photo from Ravine Wines. Now, before instantaneously dismissing the combination as disgusting, think back to all those retro ‘80s wine spritzers. What was that, if not wine with a lemon twist? Simply forgo the diluting seltzer, switch the wine from a white to light red, and change the lemon to grapefruit. Voilà! The slight grapefruit undercurrent in the light red wine would cut through both oiliness and heaviness, leaving a refreshingly clean taste. 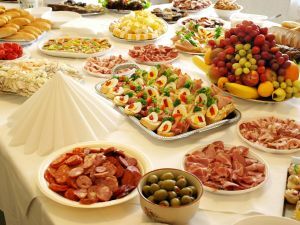 What's missing from this spread? Keuka Village Red! Photo by Lenka Pužmanová. Like that stunningly unanticipated spring day, Keuka Village Red is a bold refreshing choice for those who take chances on something new or different. Some will welcome the change of pace, while a few might find its novel twist too striking. What to do? Cover your bases. For only $13, buy it; buy a favorite backup “Plan B” bottle, open both, and let your friends try them for themselves. 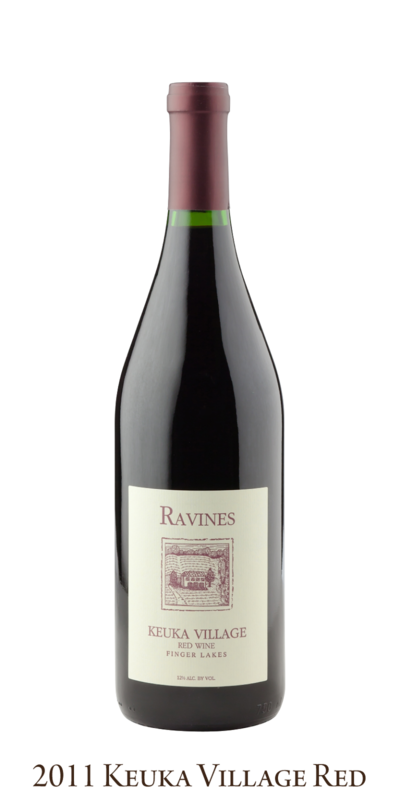 Ravines Wine Cellars 2011 Keuka Village Red: such a flirt, but a (charmingly) unexpected one, too.